Sennheiser XS Wireless 2 systems follow on from the popular XS Wireless systems to offer 'XL performance' and 'XS price'. 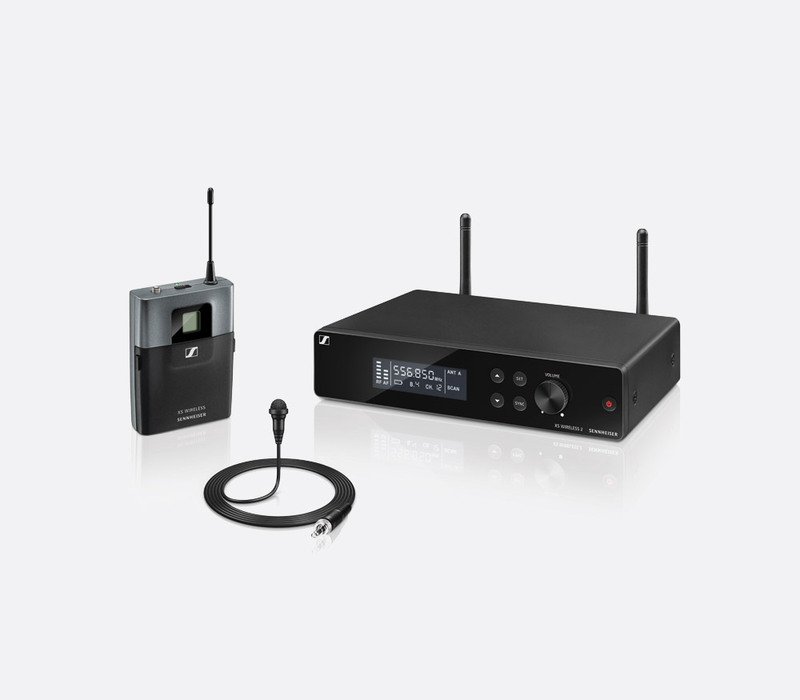 Designed for presentation, vocal, and instrumental use in music, theatre, and speech applications, these systems combine 'reliable transmission' with 'professional live sound'. The systems utilise a quick setup feature using 'one-touch' sync to search automatically for free frequencies and synchronise the systems via RF remote. Systems are offered with dynamic or condenser hand-held transmitters in addition to belt-pack transmitters with either miniature body-worn or head-worn microphones or for use with electric instruments, such as guitars. Receivers may be mounted in a standard rack, using the included rack kit hardware. These systems are offered set for channel 38 (606 - 614 MHz), which is the range for licensed radio microphones and in-ear monitors in the UK; or for channel 70 (863 - 865 MHz), a smaller but licence-exempt band for UK use. A licence is required to operate this equipment in channel 38. Up to date information should be available at www.jfmg.co.uk. Twelve systems may be operated simultaneously in one location. Eight frequency banks are available, each can have a maximum of twelve preset channels. Frequencies are set by selecting a frequency bank and then a preset channel. The receiver can then be set to scan for an unused channel within a frequency bank and select it. The settings selected on the receiver can then be transferred to the transmitter by pressing the sync button on the transmitter and then the sync button on the receiver. The receiver has adjustable squelch to reduce RF interference. Transmitters have mute buttons; the user can prevent the audio from being heard without intervention at the receiver or by the sound operator. Noise: Better than -103dB, A weighted. Distortion: Less than 0.9% THD. Transmitter synchronisation: 2.4GHz low power OQPSK, only active during sync process. Operating time: 10 hours. Operating temperature: 0 to 40 degrees C.
The EM-XSW 2 receiver is supplied as part of any XS WIRELESS 2 system. This true diversity receiver has two rear antennae which may be removed and mounted remotely with optional hardware. The receiver has been constructed in a metal housing, has both balanced 3-pin female XLR and unbalanced 6.3mm jack output connections, and may be rack-mounted using supplied rack kit hardware. The front of the fixed receiver has an illuminated power button, volume control knob, set button, sync buttons, up/down navigation buttons and an LCD display. The display shows current frequency, channel, bank, RF and AF levels on bar-graphs, battery charge status of transmitter; scan, preset, tune menu items; active antenna. The 'Up', 'down' and 'set' buttons navigate the menu to set the frequency. The 'sync' button transfers the setting to a transmitter. The rear of the unit houses 2x BNC, 50ohm connections for supplied antenna, squelch level, rotary control and DC 12V power input, coaxial, with associated cable grip. Sensitivity: Less than 3uV, for 52dB A RMS signal to noise. Audio frequency response: 50-16000Hz. Audio outputs: +12dBu maximum, balanced, 3-pin XLR; +6dBu maximum, unbalanced, 6.35mm jack. Power source: 12V DC nominal, 300mA. Dimensions: 200 x 127 x 42mm. Weight: 680g. Included accessories: 2x rod antennae, rack mount kit, manual, power adapter. Ordering Note: The included power adapter includes a UK connection type only. The optional NT 12-5CW power supply includes multiple country specific adapter types. Both these handheld transmitters utilise the same metal and ABS housing, designed for reduced handling noise and ergonomics. The SKM865-XSW is fitted with a super-cardioid condenser capsule, to 'capture every detail', the SKM 35 has a cardioid dynamic capsule offering 'the legendary e835 sound'. The body of the handheld microphone transmitter houses an LCD display panel that shows frequency, battery capacity remaining, bank and group. Below the LCD display is a slide mute switch with red and green indicating markers. The lower part of body unscrews to reveal battery compartment. A fixed ABS aerial is located at the bottom of the microphone along with power button, and power indication LED. Frequency response: 50-16000Hz. Power source: 2x 1.5V AA cells. Battery life: 10hours, approximately. Dimensions: 5 x 260 (diameter x length) mm. Weight: 245g approximately. Included accessories: 2x AA cells, manual, MZQ-1 stand-mounting microphone clip. This bodypack transmitter is included in the three belt-pack systems; it may be used with condenser microphones or instrument pick-ups. 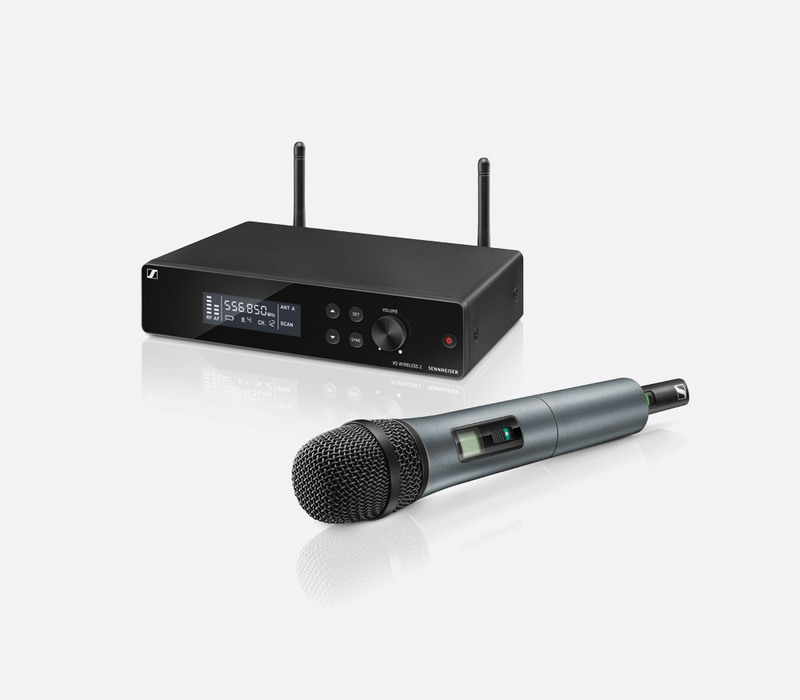 Powered by two 1.5V AA size batteries, the SK-XSW can operate on microphone or line setting for approximately 10hours. Manufactured from ABS plastic. The battery compartment is located behind a hinged door on the front of the unit; this also gives access to the power button, sync button - to sync frequency and settings to EM-XSW2 receiver, and sensitivity selector with options of 0, -10, -20, and -30dB settings. The LCD display shows remaining battery life along with current frequency, bank and group ID. The top of the transmitter houses a green LED to signify power, a 3.5mm locking jack socket for microphone input, fixed whip aerial, and sliding mute switch. Input voltage: 1V RMS microphone setting; 2.6V RMS line setting; both nominal at -30dB gain. Frequency response: 50-16000Hz, microphone and line settings. Power source: 2x 1.5V AA cells. Dimensions: 71 x 96 x 28mm. Weight: 95g approximately. Included accessories: 2x AA cells, manual, transmitter pouch. Designed for use by singers, speakers and presenters, this package contains: One EM-XSW2 receiver and one SKM 835-XSW transmitter, each with included accessories as listed above. Designed for use by singers, speakers and presenters, this package contains: One EM-XSW2 receiver and one SKM 865-XSW transmitter, each with included accessories as listed above. Designed for use by speakers and presenters in education, conferencing, or lectures. Easily attached to clothing using the supplied clip, the ME 2-2 is an omni directional, condenser microphone. Sensitivity: 5mV/Pa. Sound level: 142dB SPL maximum. This package contains: One EM-XSW2 receiver, one SK-XSW bodypack transmitter, and one Sennheiser ME2-2 lapel microphone, along with included accessories as listed above. Designed for use by speakers and presenters in education, conferences, or lectures. Easily attached to clothing using the supplied clip, the ME 3-II is a cardioid, condenser, head-worn microphone. Sensitivity: 1.6mV/Pa. Sound level: 150 dB SPL maximum. 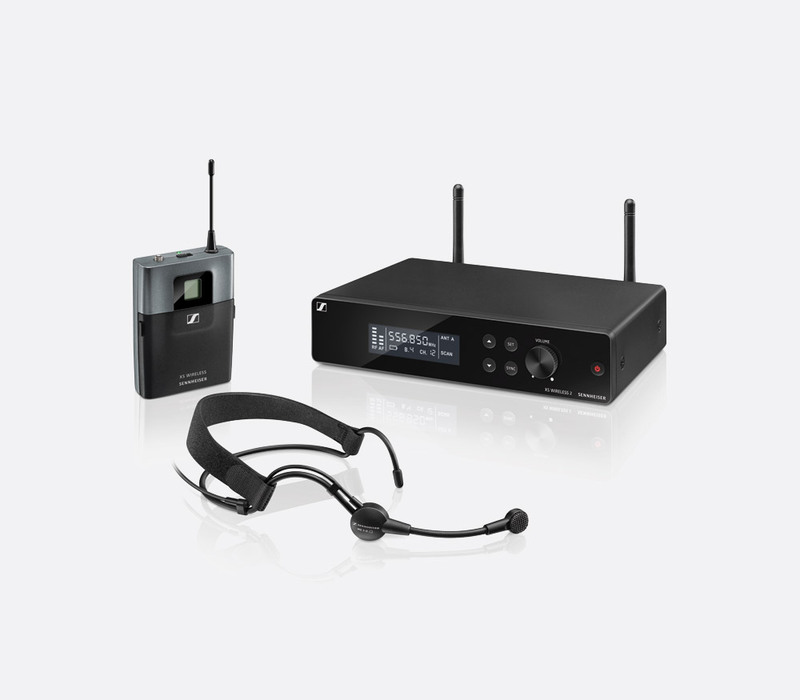 This package contains: One EM-XSW2 receiver, one SK-XSW bodypack transmitter, and one Sennheiser ME3-II headset microphone, along with included accessories as listed above. Designed for guitars and instruments with a jack socket, this offers 'natural sound reproduction'; the instrument connects directly to the body-pack transmitter. 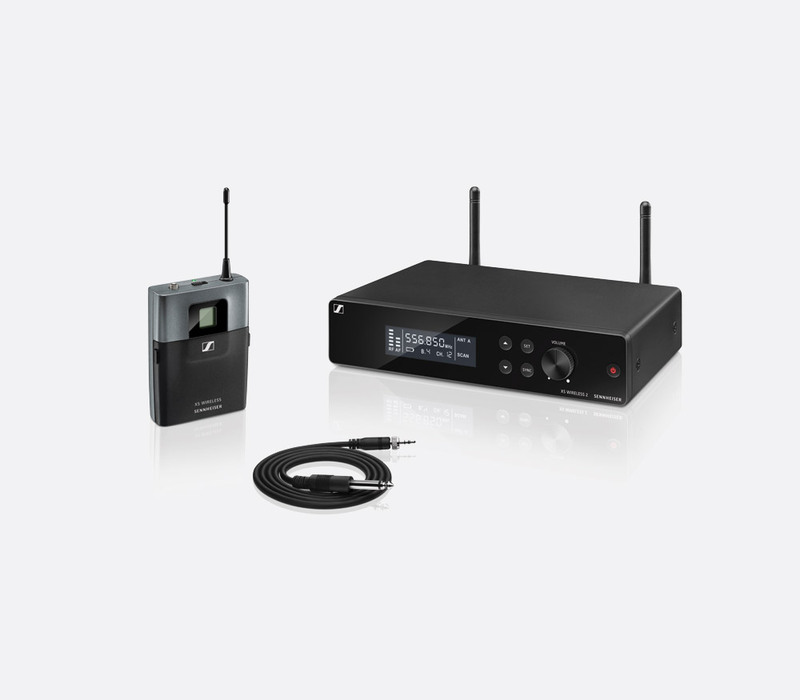 The package contains: One EM-XSW2 receiver, one SK-XSW bodypack transmitter, and one Sennheiser CI1 6.35mm jack to 3.5mm jack instrument cable, along with included accessories as listed above.